» Inter-faith Prayer, Peace March and Public Meeting Mark Day Two of ‘Tibetan People’s Solidarity Campaign’. 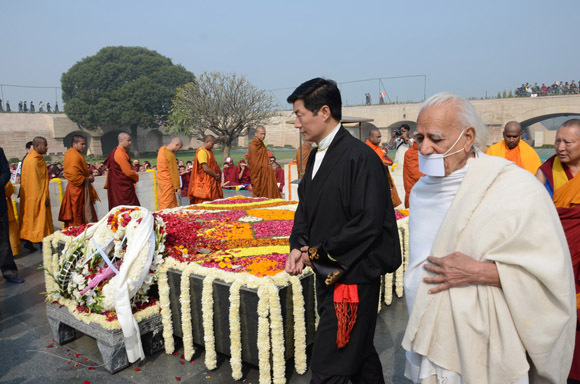 January 31, 2013, Delhi: Day 2 of ‘Tibetan People’s Solidarity Campaign’ began with an interfaith prayer held from 1030 hours to 1230 hours at Rajghat. 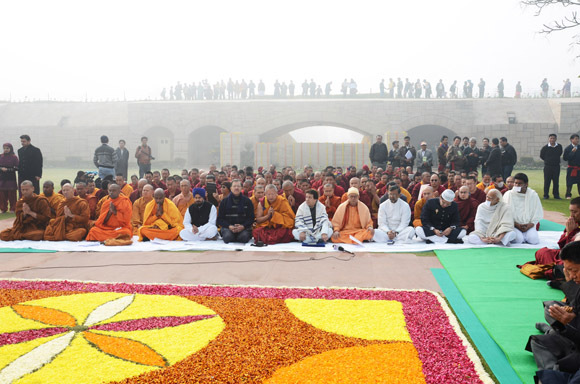 Religious leaders’ representatives led the prayer meeting from Buddhist, Christain, Islam, Jain, Hindu, Sikh, Bahai and Jew faiths. H.E. 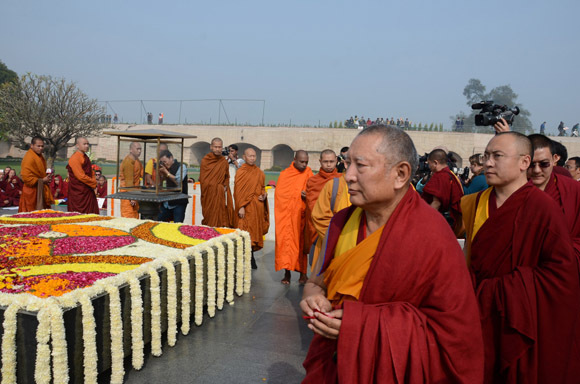 Kirti Rinpoche, the religious head of Kirti Monasteries where more than 30 self-immolations took place along with over 700 Tibetan Buddhist monks took part in the prayer meeting that was attended by over 7000 people. 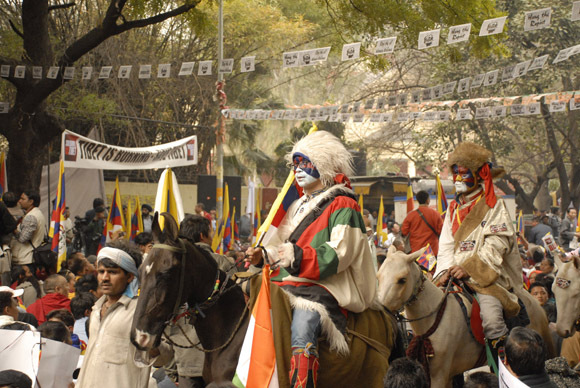 From 1400 to 1630 hours, the crowd gathered at Jantar Mantar for a daylong sit-in. 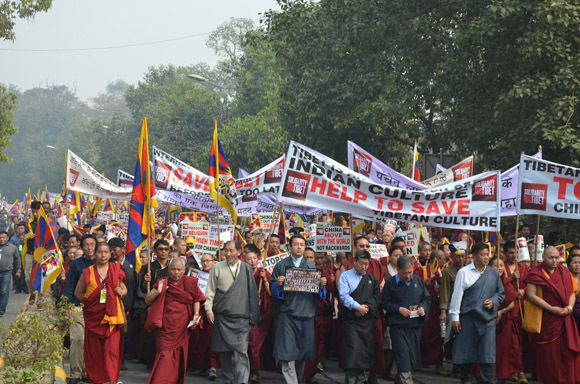 TPIE member Acharya Yeshi Phuntsok in his opening address in Hindi gave an overview of the 4-day ‘Tibetan People’s Solidarity Campaign’ being held in Delhi and an insight into the role of Indian supporters and leaders for the Tibetan cause. 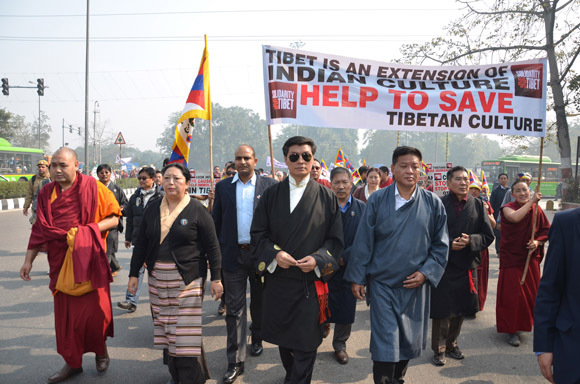 Mr. Penpa Tsering, speaker of TPIE was the master of the ceremony for the daylong program that concluded at 1630 hours with chanting of slogans by the public and recitation of ‘Prayers of the Words of Truth’ led by artists from Tibetan Institute of Performing Arts (TIPA). A public film screening of the film ‘Tibet in Song’ by Ngawang Choephel, took place at Ansara Auditorium, Jamia Islamia University at 1500 hours. Mr. Tempa Tsering , Delhi Representative of His Holiness the Dalai Lama spoke at the event and engaged in a post screening interactive question and answer session. A panel discussion on ‘Tibet: the current situation and its implications for India and China’ was held at India International Centre from 1400 hours to 1700 hours. Sikyong Dr. Lobsang Sangay, Ven. Kirti Rinpoche, Lalit Mansingh, former Secretary, Ministry of External Affairs and Jayadeva Ranade, former Cabinet Additional Secretary were the key speakers at the discussion moderated by TPIE member Mr. Karma Chophel.